During the install process of NSX, my environment refused to install the NSX agents on the host. When you prepare the host clusters for network virtualization a collection of VIBs are installed on each ESXi Node of the selected cluster. This process installs the functionality such as Distributed Routing, Distributed Firewalls and the user world agent that allows the distributed vSwitch to evolve into a NSX Virtual Switch. Not very helpful in order to troubleshoot the error. I followed the KB article 2075600 (Installation Status appears as Not Ready in NSX (2075600), and made sure time and DNS were set up correctly. But unfortunately, it didn’t solve the problem. Until I started to dissect the process of what Install at the Host Preparation actually does and how the components connect to each other. This made me review the settings of the NSX Manager and discovered I selected the port group designated for my management VMs on the standard switch instead of the distributed switch. It makes sense to connect it to a Distributed Switch, maybe this is the reason why many write-ups on how to install NSX assume this is basically knowledge and fail to list it as a requirement. 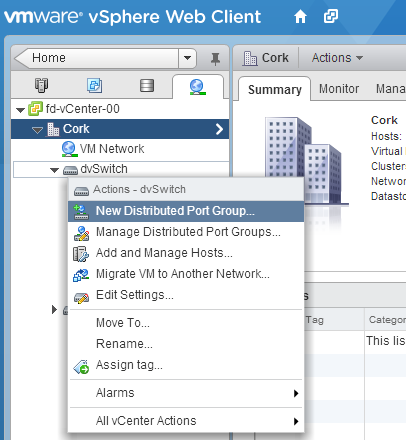 The UI allows you to select a standard vSwitch Port Group or a Distributed Port Group. Don’t make the same mistake I made and make sure you select the appropriate Distributed Port Group. 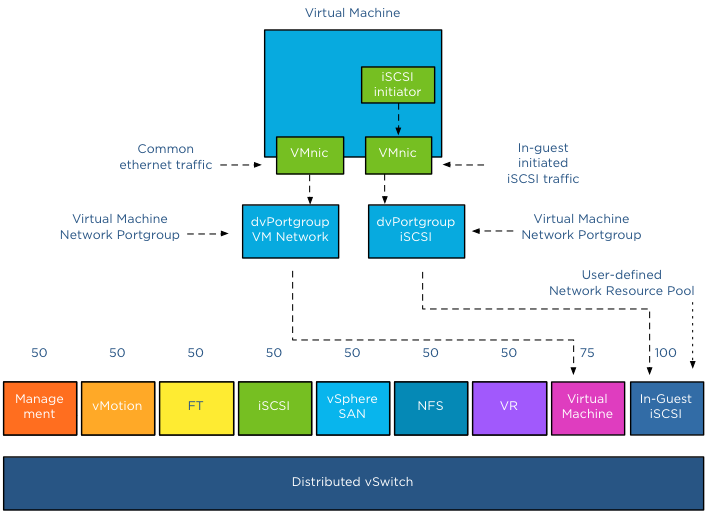 This article provides you an overview of the steps required to setup a Multi-NIC vMotion configuration on an existing distributed Switch with the vSphere 5.1 web client. This article is created to act as reference material for the designing your vMotion network series. Configuring Multi-NIC vMotion is done at two layers, first the distributed switch layer where we are going to create two distributed port groups and the second layer is the host layer. 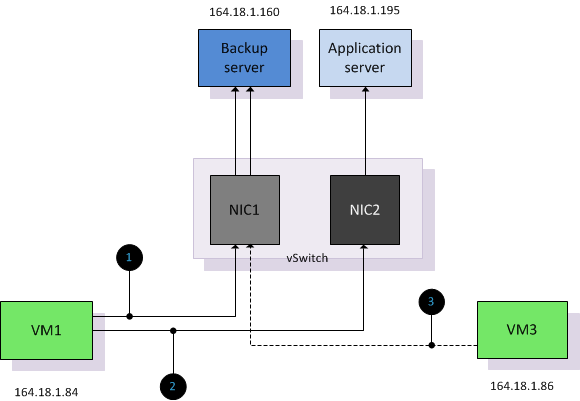 At the host layer we are going to configure two VMkernel NICs and connect them to the appropriate distributed port group. Before you start you need to have ready two ip-addresses for the VMkernel NICs, their respective subnet and their VLAN ID. The first two steps are done at the distributed switch level, click on the networking icon in the home screen and select the distributed switch. 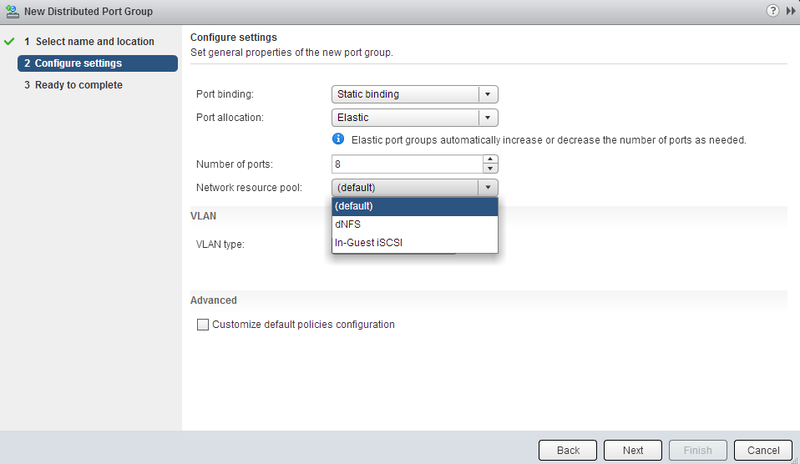 1: Select the distributed switch, right click and select “New Distributed Port Group”. 2: Provide a name, call it “vMotion-01” and confirm it’s the correct distributed switch. 3: Keep the defaults at Configure settings and click next. 4: Review the settings and click finish. 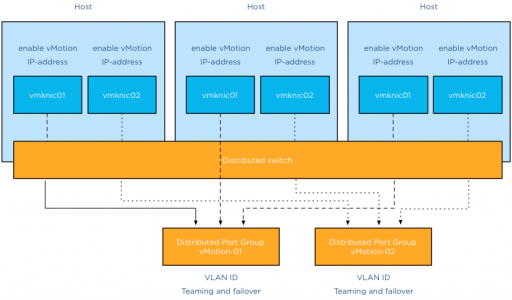 Configuring the vMotion distributed port groups consist of two changes. Enter the VLAN ID and set the correct failover order. 1: Select distributed Port Group vMotion-01 in the left side of your screen and right click and select edit settings. 2: Go to VLAN, select VLAN as VLAN type and enter the first VLAN used by the first VMkernel NIC. 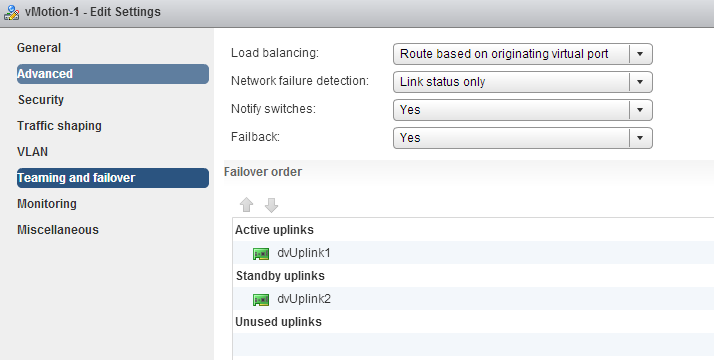 3: Select “Teaming and failover” , move the second dvUplink down to mark it as a “Standby uplink”. Verify that load balancing is set to “Route based on originating virtual port”. Repeat the instructions of step 2 for distributed Portgroup vMotion-02, but use the VLAN ID used by the IP-address of the second VMkernel NIC. 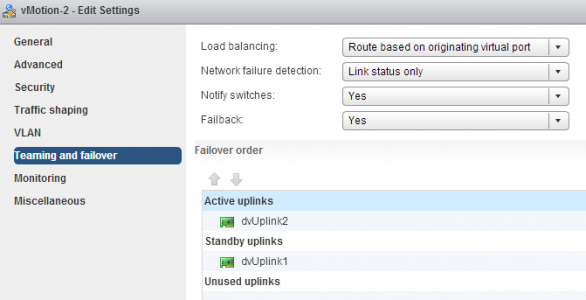 Go to teaming and failover and configure the uplinks in an alternate order, ensuring that the second vMotion VMkernel NIC is using dvUplink2. We are done at the distributed switch level, the distributed switch now updates all connected hosts and each host has access to the distributed port groups. Two vMotion enabled VMkernel NICs are configured at host level. Go to Hosts and Clusters view. 1: Select the first host in the cluster, go to manage, networking and “add host networking”. 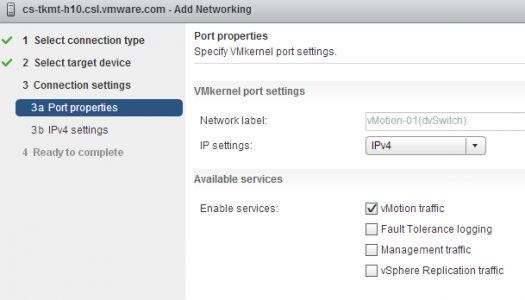 2: Select VMkernel Network Adapter. 3: Select an existing distributed portgroup, click on Browse and select distributed Port Group “vMotion-01” Click on OK and click on Next. 4: Select vMotion traffic and click on Next. 5: Select static IPv4 settings, Enter the IP-address of the first VMkernel NIC corresponding with the VLAN ID set on distributed Port Group vMotion-01. 6: Click on next and review the settings. 2: Enter IP-address corresponding with the VLAN ID on distributed Port Group vMotion-02. 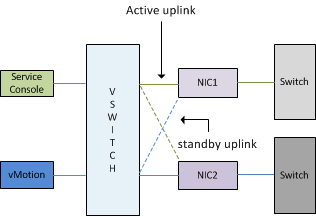 The setup of a Multi-NiC vMotion configuration on a single host is complete. Repeat Step 3 on each host in the cluster. 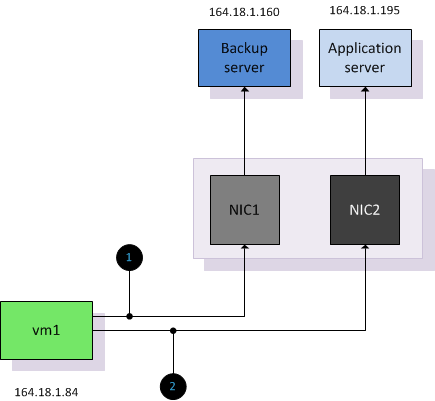 Some customers use iSCSI initiators inside the Guest OS to connect directly to a datastore on the array or using an NFS client inside the Guest OS to access remote NFS storage directly. Thereby circumventing the VMkernel storage stack of the ESX host. The virtual machine connects to the remote storage system via a VM network portgroup and therefore the VMkernel classifies this network traffic as virtual machine traffic. This “indifference” or non-discriminating behavior of the VMkernel might not suit you or might not help you to maintain service level agreements. In the 1Gbe adapter world, having redundant and isolated uplinks assigned for different sorts of traffic is a simple way of not to worry about traffic congestion. However when using a small number of 10GbE adapters you need to be able to partition network bandwidth among the different types of network traffic flows. This is where NetIOC comes into play. Please read the “Primer on Network I/O Control” article to quickly brush up on your knowledge of NetIOC. By default NetIOC provides seven different system network resource pools. Six network pools are used to bind VMkernel traffic, such as NFS and iSCSI. One system network resource pool is used for virtual machine network traffic. The network adapters you use to connect your IP-Storage from within the Guest OS connect to a virtual machine network portgroup. Therefor NetIOC binds this traffic to the virtual machine network resource pool. In result this traffic shares the bandwidth and prioritization with “common” virtual machine network traffic. Most customers tend to prioritize IP storage traffic over network traffic induced by applications and the guest-OS. To ensure the IP-Storage traffic created by the NFS client or iSCSI initiator inside the Guest OS create a user-defined network resource pool. 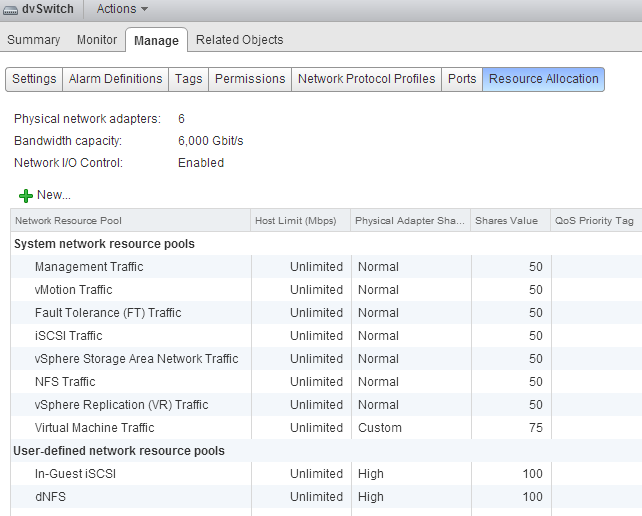 User-defined network resource pools are available from vSphere 5.0 and upwards. Make sure your distributed switch is at least version 5.0. Shares: User-defined network resource pools are available to isolate and prioritize virtual machine network traffic. 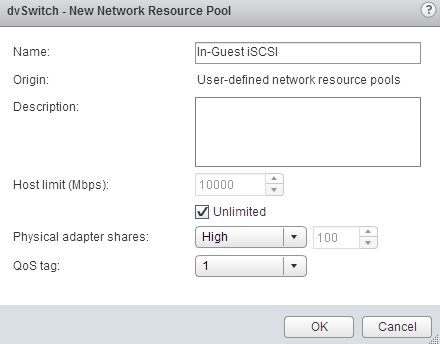 Configure the User-defined network resource pool with an appropriate number of shares. The number of shares will reflect the relative priority of this network pool compared to the other traffic streams using the same dvUplink. QoS tag: Another benefit of creating a separate User-defined network resource pool is the ability to set a QoS tag specifically for this traffic stream. If you are using IEEE 802.1p tagging end-to-end throughout your virtual infrastructure ecosystem, setting the QoS tag on the User-defined network resource pool helps you to maintain the service level for your storage traffic. In a greenfield scenario setup the User-defined resource pool first, that allows you to select the correct network pool during the creation of the dvPortgroups. If you already created dvPortgroups, you can assign the correct network resource pool once you create the network resource pool. 1. Open your vSphere web client and go to networking. 5. Click on the new icon.